The animals in ZOOKEEPER can talk. What’s more, they all speak English. Convenient! 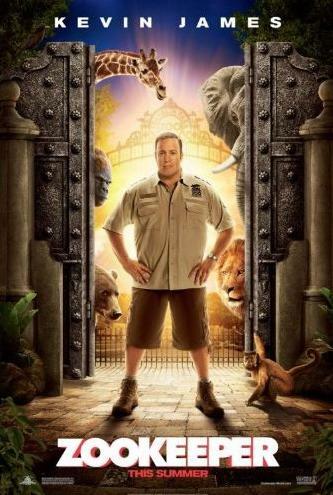 The canny critters concealed their gift of gab from we unsuspecting homo sapiens all these years, but have decided to break their code of silence to give mating advice to lovelorn Franklin Park zookeeper Griffin (Kevin James). Forget Lassie, Rin Tin Tin, and Gentle Ben. Nevermind Clint Eastwood’s near-psychic bond with Clyde the Orangutan. Those furry film friends just weren’t ready to divulge the secret of their sprechens. But now—to help a buddy get laid—Mother Nature’s muzzles come off, and giraffes will sing like birds. Yes! Hey, you can’t walk into these lowbrow comedies expecting accurate depictions of hard science or sympathetic dramatizations of boy-girl relationships. It’s all about going for one gut-buster after another—which director Frank Coraci (THE WATER BOY, CLICK) attempts here with the King of Queens funnyman. It’s a hit-and-miss proposition; pee and poop jokes abound. Griffin lapses into a funk after high-maintenance fiancé Stephanie (Leslie Bibb, the Vanity Fair reporter from IRON MAN) rejects his marriage proposal. But she turns up in New England again five years later, hoping to whip the lowly zookeeper into the Armani-suited success story she’s always wanted him to be. Griffin—a decidedly non-alpha male doofus—receives tips on playing narcissist bad-boy from wolves and frogs. Predictably, zesty zoologist Kate (Rosario Dawson) develops a crush on her affable colleague while conspiring in the facade. We know where this is going; ZOOKEEPER adheres to that old forest-for-the-trees script wherein our overzealous Romeo takes for the granted the love right in front of his face. Jon Favreau and Faizon Love voice a pair of grizzlies who squabble like Felix and Oscar from THE ODD COUPLE. Sylvester Stallone and Cher are the park’s lion and lioness. Judd Apatow voices a diet-challenged elephant. Griffin finds a confidante in Bernie, a silverback gorilla (Nick Nolte) with trust issues. The film’s livelier gags involve the ape partying at T.G.I. Friday’s and driving an escape van. Later, there’s a visual homage to KING KONG at Bunker Hill Memorial Bridge. Ken Jeong plays a creepy herpetologist and Donnie Wahlberg is a shady maintenance man. Adam Sandler’s irreverent Capuchin monkey drew huge laughs at our screening, and Joe Rogan is well-cast as Stephanie’s arrogant new beau—a blowhard who bests Griffin at ballroom dancing and bike racing. But when Sandler and the former FEAR FACTOR host are among your film’s strengths, you might want to reassess things. Seventies hits by Toto (“I’ll Supply the Love”) and Exile (“Kiss You All Over”) are well-placed, as is adrenalized Motley Crue track “Kickstart My Heart.” Featured songs by Barry White and Flo-Rida have been used better in other recent comedies—but kids will enjoy ZOOKEEPER’s end credits, wherein the animals karaoke to Boston’s “More Than a Feeling” (Sly Stallone does Aslan, doing Brad Delp—yikes!). Indeed, this DVD-ready romantic comedy is tailored for tots (notwithstanding four instances of H-E-double-L). However, the primates and pachyderms should warn James to avoid similar roles in the future, lest he cage himself in the typecast prison of portly-guy-does-pratfalls (a la Chris Farley, Jack Black). Oops, too late. ZOOKEEPER also boasts one of the most original product placements ever: a Red Bull can is extracted from inside a choking feline. 2 out of 4 stars.